Not too long ago, I signed up to take a wonderful journaling e-course from Hope Wallace Karney called Nostalgic Musings. Since the class, I've been adding to my journal bit by bit and thought I would share a few pages with you that I recently completed. 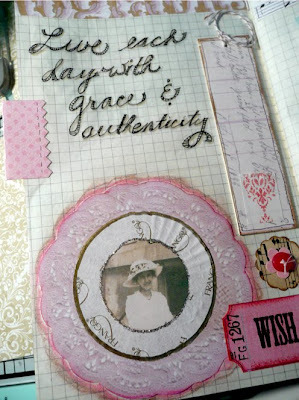 The page above features a favorite quotation and a paper lace doily I tinted pink with Glimmer Mist. Then I added a pleated candy paper from one of my favorite chocolates - Frango Mints. The long tag on the right side of the page is a clothing tag from a Merona t-shirt I purchased from Target that I covered with pretty paper. I found a rubber stamp with another favorite quote which I just stumbled upon, I think at Hobby Lobby - but I'm not 100% sure about that. The chipboard scalloped oval I cut from a cereal box using my Sizzix machine. It's that original red machine they made which I dug out to sell at a garage sale. I was playing around with it in between sales and I had so much fun I decided not to sell it afterall. This page I just finished this morning. Hope likes to use a lot of cupcake liners in her journals and I like that look also. There are so many fun designs out there now. These two I picked up from Michael's, thanks to my sweet friend Elyse who told me about them. I drew this little birdie free hand. He reminds me of the little wren that I told you about in this post. The "souvenir" card is from Olga's Designs, who sells the most beautiful digital art on Etsy. I attached a fabric tab to the bottom and hinged it with washi tape on the top so I can add "secret" journaling underneath. Another cereal box scalloped oval with a graceful swan inside. The template for the swan came from the tag on a pair of Gloria Vanderbilt jeans - the swan is the company logo. What loveliness! Your work is simply beautiful, just like you! I am missing our NMG journal swap. Hopefully it will pick back up soon. 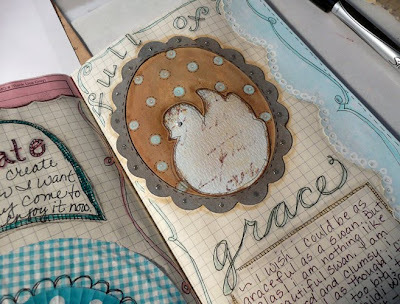 I love the graph paper journals that you use, so much texture. Jeanne...it's gorgeous! That's so funny you used a clothing tag...love it! I need to do a journaling class to get me going on my journal. Your drawings give the pages that extra dash of personality. Plus, I love the cheerful colors that you used. Really beautiful pages! 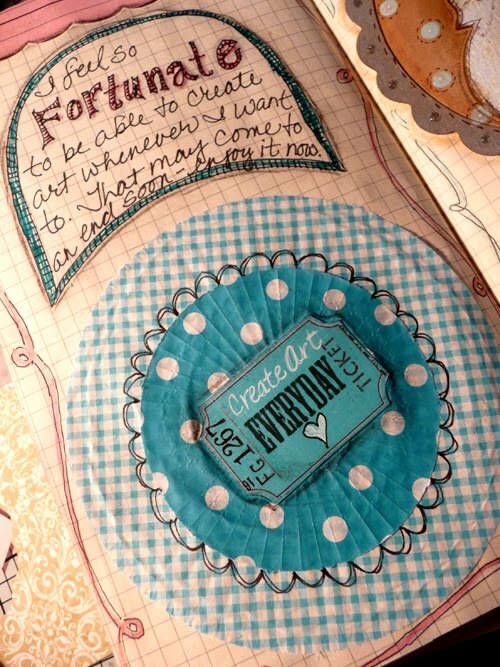 Love all your ideas - cupcake wrappers, cereal boxes, tags - and the colors are gorgeous! 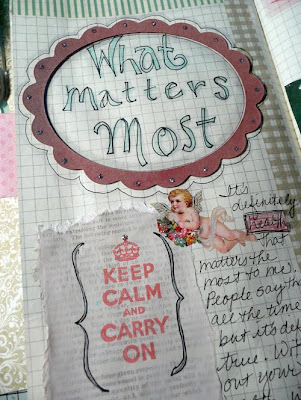 So happy to hear you are keeping up with journaling - these pages are wonderful! Wish I could flip through them in person! just found you on facebook! yay!! Jeanne ~ What a darling creation ... love the colors. 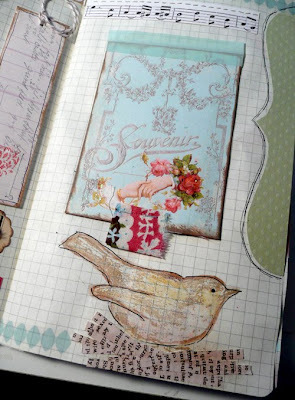 Jeanne, your journal pages are gorgeous, gorgeous, gorgeous! Charming, Jeanne! Just love it.